This heavy-duty, premium rope dog leash is easy on your hands but built for the most powerful dogs. Secure, durable collar attachment allows for worry-free walks with your dog. We manufacture a wide variety of Dog Training Leashes. These are manufactured using top grade BRIDLE LEATHER. The LEASHES offered by us have the following features: Three point adjustable with maximum length 200cm. Top grade Bridle leather. Hand Stitched and hand finished edges. Available in different widths and colors. We are engaged in providing a wide range of products to our clients Dog Leash. Being quality-centric firm, we are engaged in presenting a high-class range of Red Dog Belt Straps. With rich industry experience & knowledge, we have been able to provide the best array of Chain Dog Leash. 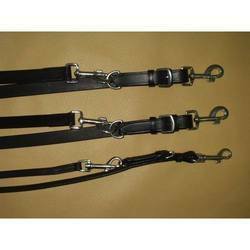 We are one of the leading entities of this domain, engaged in offering Dog Embossed Lead. We have been supplying pet products to European And American Countries.We can help you get the best products in pet industry . The artisan team of our company offers adequate variety of Dog Leashes to our esteemed clients. Keeping in mind the shapes, sizes, colors and embellishments of these leashes, we design these dog leashes by using high quality leather which provides comfort to dogs. To meet variegated demands of our patrons, we are betrothed in providing a high-class series of PP Premium Dog Rope Leash. These are available in diverse configurations that meet on customer’s demand. We are in the business of providing durable Dog Leashes used for controlling dogs. The company is the noted Manufacturer, Supplier and Exporter of high quality Dog Leashes. For the making of our Dog Leashes, we use superior grade raw materials. Our Dog Leashes are acknowledged for their high strength as well as perfect finish.